Solid wood furniture brings beauty, dependability and elegance to any space. When you choose one of these quality pieces, you know you’ve selected furniture that will last a lifetime. As you make your selection, it’s also important to choose the right upholstery fabric to accompany your solid wood furniture. This final touch completes your furniture and personalizes the piece to match your style and space. Whether you are mixing wood and upholstered chairs or are looking for a solid wood upholstered bed, you must consider many factors to decide what type of fabric is best for your upholstery. Following are tips for choosing upholstery fabric for every area of your home. Use this guide to find the perfect pieces to create ideal surroundings for you and your family. Let’s start by reviewing the many factors that influence how to choose the right upholstery fabric. What Type of Fabric Is Best for Upholstery? What must your upholstered furniture endure? Do you have small children? Pets? Are you choosing a dining set for formal settings or a family couch for those daily rough-and-tumble visits from Fido, as well as your kid and their friends? Decide how durable your upholstery should be, then let this guide your selection. Keep in mind that woven patterns typically offer greater durability than printed ones. If you need a durable choice, look for higher thread counts and tight weaves. The thread count tells you how many threads there are per square inch. More threads mean a denser material for improved durability. For pieces that must withstand harsh use, leather and microfiber are often good choices. What is your style? To decide which type of fabric is best for your upholstery, consider both the look of the furniture and its intended space. It’s best to pair traditional with traditional, and contemporary with contemporary. Mixing the two can often lead to a piece of furniture that clashes with itself. Consider also what you want to achieve for the room. Do you want to create a light and airy space? Warm and welcoming? Depending on the style you want, choose the appropriate upholstery. Light and airy calls for lighter materials and patterns. For lush surroundings, look for more luxurious materials. In most cases, bigger patterns work better with bigger furniture pieces and spaces. For a quaint, charming area, a smaller pattern design is usually best. What is the purpose of the furniture? Do you plan to curl up and watch TV or entertain guests? Will you sit for hours in the chair while working at your desk or are you choosing a decorative piece for your hallway? For a dining set, is the room formal or casual? Answering these questions will help you determine what type of fabric is best for the upholstery. For informal spaces with frequent use, consider comfort and durability. For more formal and less frequently used areas, the upholstery can be more decorative and more delicate. The color of your upholstery is a significant consideration and involves several factors. First, consider the size of the room. Bold colors might be too much for a small space or feel overwhelming if the fabric is for a large sofa. Choose the right shade for the size of the furniture and room. The next consideration is trends. Be careful about choosing something because it’s in style. Bright orange might be the color of the year, but will you still like it five years from now? You might be happier long-term if you choose a classic color that you’ll enjoy years down the road. Keep in mind that solid colors are more timeless than patterns. If you want to add a little personality, you can always incorporate a splash of character with throw pillows or blankets. These are much easier to switch out if color styles change. Finally, consider the colors in the rest of the room. If you are choosing a patterned upholstery, use a color from the palette of the room. Look to nearby décor for inspiration. A rule of thumb for decorating with colors is to use the 60/30/10 rule. Choose a dominant color for 60 percent of the space — this will typically include the walls. A secondary color should cover another 30 percent of the area and should feature your upholstery. The remaining 10 percent is made up of accessories. The result is the percent balance of color. F for fade — Where will the furniture be located? Will you place it in a sunny room where it will endure daily sun rays that could fade its colors? Before choosing a fabric and color, find out if it will be able to withstand any sun exposure it will receive. A for allergens — Is anyone in your household prone to allergies? Some fabrics attract more dust and pollen than others. Microfiber and similar materials are an excellent choice for reducing the number of allergens in your furniture. D for dander — Will your upholstery need to meet pet challenges? Avoid delicate fabrics if they will see paws and tails. Stay away from textures, which can snag or tear on claws and teeth. E for environment — Is your home humid? If so, keep mildew in mind as a consideration. Choose mildew-resistant upholstery to avoid undesirable growths in your furniture. Ask yourself what the upholstery will look like in five years. Will it wear well? Will you still like it? When purchasing solid wood upholstered dining chairs, a living room couch or other upholstered wood furniture, you are making a significant investment. You want to ensure your selection will offer a healthy lifespan in return. 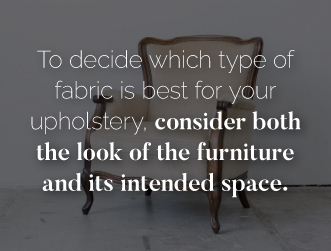 This factor often goes overlooked when choosing furniture upholstery. Find out what type of cleaning and care is required to maintain the furniture properly. Do you plan to vacuum it frequently? Is it high maintenance? Do you have the time, tools and patience needed to keep the furniture looking sharp? 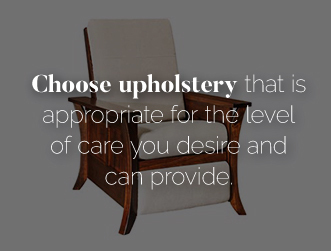 Choose upholstery that is appropriate for the level of care you desire and can provide. How big is the piece of furniture? Often, smaller ones offer an opportunity to explore more unusual patterns and personalized colors. For example, an upholstered desk chair can add a bit of flair to an otherwise stern room, while a rocking chair in a nursery can provide a whimsical touch. Don’t forget this all-important factor. If you love the way it looks, but never want to sit on it, you probably regret your decision. Make sure you like the way the fabric feels too. Does it invite you to touch, sit, recline, relax and enjoy? Considering these factors will make you happier with your selection, plus save you time and money. If you choose something that does not last, either due to poor quality or a change in taste, it can be expensive to change the look later. The typical cost to reupholster a piece of furniture down the line ranges from $40 to $1,200. In most cases, the average price is $361, with couches and small chairs ranging between $343 and $961. While the overall process is cheaper than buying new furniture, the best option is to choose durable and fashionable upholstery at the start. Many modern kitchens offer eating areas, islands with bars and other seating arrangements. To create the perfect dine-in spot, equip the space with comfort and style. Choose barstools with durable upholstery for a casual, “pull-up-a-stool,” environment. AmishOutletStore.com’s Belmont Barstool is a perfect example. Available in a variety of wood stains, this sleek barstool style provides class and comfort for your kitchen. If your kitchen is a bit more formal, or if you prefer chair-style seating over bar-style, consider bar-height chairs for your island, counter or pub table. Upholstered swivel tops are a great way to add convenience, color and comfort to your eating area. For a sample of this type of seating, view the Boston Ridge Swivel Barstool. Personalize this piece with a wide variety of fabric options. The dining room offers a plethora of options for furniture and upholstery. Keep in mind — you no longer have to choose one fabric. It’s stylish to mix and match. If your dining set features six chairs, you may want to pick two fabrics and alternate the patterns. You could even select a distinctive design for your two captain’s chairs. If you decide to go this design route, then keep in mind a few designer tips. One option is to pair solids with patterns that incorporate the same color. For example, alternate your chairs with a solid beige color and a print that includes the same shade of brown. Another option is to choose a pattern for a bench and a solid color for chair backs. 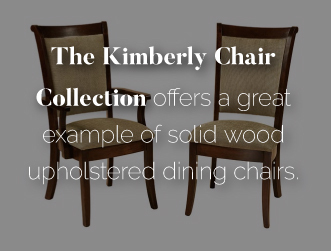 The Kimberly Chair Collection offers a great example of solid wood upholstered dining chairs that you could mix and match with different fabrics. It’s also all right to choose solid wood seats for some of your chairs and upholstery for others. The Glenwood Chair is an excellent option for this look. Leave the seating area bare for your captain’s chairs and choose fabric or leather for the others or vice versa. The living room, or family room, is often the place that houses have the most upholstery. Since it will make up a significant portion of the color of the room, you should choose your designs carefully. If you are unsure what color or pattern to select, look for inspiration in the rest of your living room or house. Do you have an art piece you love? What shapes or colors do your curtains feature? Keep in mind the 60/30/10 rule and choose something appropriate. Whether you are looking for a single recliner or an entire living room set, the Bunyan Sofa Collection is an excellent example of the perfect blend of solid wood and upholstery. This type of Amish-style furniture offers built-to-last quality and modern styles. For single pieces to add comfort and relaxation to your space, chairs such as the Franchi Recliner are ideal. Paired with a Franchi Ottoman topped with the upholstery of your choice, it creates an inviting feel for your living room. If you’re looking for a solid wood upholstered rocking chair with ultimate comfort and durability, look for pieces like the Bow Arm Slat Rocker. Bedrooms often offer an area where you can indulge yourself a little. These areas may see less wear and tear and can be the place you choose luxury materials, such as for a loveseat or bed. Your solid wood upholstered bed and other bedroom furniture can create an in-home get-away during hectic days or restless nights. Choose a bedroom set that incorporates upholstery for a stylish finish. Your headboard offers an excellent opportunity to choose fabrics that will tie your décor together and invite you into the room. The Breckenridge Bed does this perfectly. If your space allows for a chair or loveseat, choose something luxurious, like the Diamond Loveseat, to spoil yourself. Don’t forget to furnish your entire master suite. For the bathroom or dressing area, add a vanity. Complete the look of your room with a vanity bench sporting the fabric of your choice. This upholstery will give your wooden furniture the extra touch of personality and color you desire. The Mission Creek Jewelry Dressing Table is a perfect example. Keep in mind that this room requires more durable upholstery than a parent room or guest room. Choose upholstery that will hold up under children’s hands and feet. In addition to standard bed and chest sets, add a comfortable upholstered chair for reading and resting times, like the Tinkerbelle Childs Rocker. Complete their play area with a durable, solid wood Trestle Table Set. Whether you’re looking for a sturdy bunk bed set or dresser, solid Amish wood furniture is perfect for a child’s space. Finish the room’s furnishings with an adorably crafted rocking horse or classic baby cradle. Don’t forget the toy box either! Is this space all business or a hobby-town getaway? When you furnish your office, you need to know how to choose the right upholstery fabric based on its use. 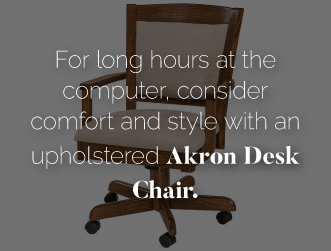 For long hours at the computer, consider comfort and style with an upholstered Akron Desk Chair. For a more formal look, choose an Executive Chair. The goal is to create an inviting space where you want to work or play, which means selecting an upholstery that offers the color, style and feel you desire. If your office sees guests for either personal or professional visits, add seating that welcomes them inside. Durango Morris Chairs are a great example of class and style for any office. If this room’s also your library, choose your favorite fabric to cover an inviting Mission Rocker or Mission Glider, or add the classic Library Wing Chair. Keep comfort at the top of the list as you select upholstery to create a place for reading and relaxing. Do you need an upholstered piece for a hallway, grand foyer or formal living room? These areas are the best for using luxury upholstery to show off your style and class. For these spaces, Early American Upholstered Furniture is ideal. Choose from solids, patterns or a combination to create your desired look and feel. A Formal Camelback Sofa is great for larger spaces, while a combination of Westboro Chairs is perfect for smaller areas. These rooms can be difficult to furnish. You want to strike the perfect balance between fashion and fun. Adding a game table or bar are great solutions. When it comes to seating, make sure you choose upholstery that is durable, yet stylish enough for entertaining guests. Game Room Chairs are an obvious choice for this kind of room. You can also consider lining the walls with quality bookcases to showcase games, trophies or other items. Brentwood Bookcases are available in a variety of sizes to furnish any game room too. If you plan to add a media center to your entertainment space, choose a gorgeous wall unit or stereo hutch. Does your property include an outdoor oasis? Decks and patios are ideal for durable wood furniture with outdoor upholstery. The right fabric can completely transform your outdoor space. Enliven the area with bright colors, or create a calm and soothing patio with earth tones. The sky is the limit. Just choose upholstery that is designed to weather the outdoors, as well as complementary pillows and cushions for your outdoor wood furniture. If you need some inspiration for your deck or patio, look to the Brentwood Double Glider. Pieces like this invite you and your guests to sit and enjoy your surroundings during the warm summer evenings and crisp fall nights. For dining al fresco, sets like the Portsmouth are perfect. Complete your outdoor space with benches, swings and side tables. As you furnish your home with the best wood furniture and upholstery, don’t forget your best friends! They live in the house too, so feel free to incorporate your pawed pals in your furniture design. Pet Coffee Tables are what your cats would call, “purrfect!” Lined with durable upholstery for your pet, they add character and charm to your space. Additional options for your pet include ramps, steps and beds. With these pieces in place, your best friends will feel right at home, and they’re less likely to make their home on the human furniture. Once you’ve chosen your main furniture pieces and the best upholstery to accompany them, you can apply the tips for choosing upholstery fabric to the rest of your selections. As you decorate the space around your furniture, look for durability, quality and style. Choose items that will not only complement your solid wood furniture but will last. For unique accessories to complete your home, consider solid-built wooden Amish accessories. Rustic barrels and wall shelves can add the perfect touch to your space. With form and functionality, items like wooden hall trees and utility cabinets make your home both livable and inviting. Your options are nearly limitless when it comes to solid wood upholstered dining chairs, couches, benches and anything else you need for your home. That’s why it is essential to know where to look for quality items that you can enjoy in your home for generations to come. AmishOutletStore.com is your premier choice. All our solid wood, quality furniture is made in the U.S., and our business is family owned and operated. Based out of Smithville, Ohio, we’ve kept our operations near the heart of Amish country. Our handmade Amish furniture features the perfect combination of old-world craftsmanship and modern methods. It’s also crafted from solid materials, such as oak, cherry and QS white oak. Our designs range from classic to contemporary, suiting every style. All our furniture is made to your specifications with high-quality materials — and by crafters with exceptional skill. From generation to generation, we’ve passed down our construction techniques to continue delivering solid furniture that you, as well as your family and pets, can depend on for ages. For functional and practical furniture with unparalleled beauty, visit AmishOutletStore.com and peruse a wide selection of furniture for every area of your home. If you have questions about our fully customizable furniture, contact our team.